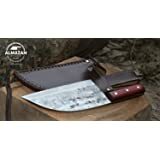 Acero alemán de alto contenido en carbono de primera calidad: tecnología de vanguardia, artesanía sobresaliente, diseño único impresionante y materiales de primera calidad. Es resistente al desgaste, duradero, resistente al óxido y las manchas. 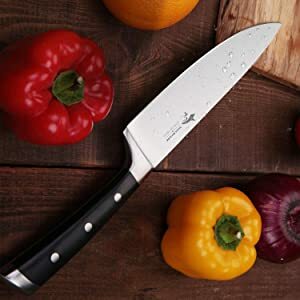 Diseño de borde hueco: increíblemente afilado, este cuchillo de chef profesional puede cortar, rebanar y cortar fácilmente varias frutas, verduras y carnes, perfecto para cocinas ocupadas. 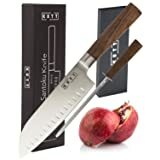 Mango de polímero alto de grado militar: la durabilidad y confiabilidad del cuchillo de cocina están aseguradas por el diseño de triple remache que sujeta firmemente el mango a la hoja. Hoja extremadamente afilada: mejor filo más largo que los cuchillos de acero, debido a la dureza extrema de HRC 50. Garantía de por vida: 100% de satisfacción o garantía de devolución de dinero, Garantía de por vida contra defectos o mano de obra, Pruébelo sin riesgos. Te encantará y no podrás librarte. MAD SHARK knives are made of high-quality German stainless steel, that resists rust, corrosion, and discoloration. 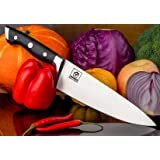 The razor-sharp edge is easy to maintain and makes cutting or chopping a breeze. The solid handle is comfortable to hold. Each handle is engineered to gently widen where it meets the blade to help protect fingers. 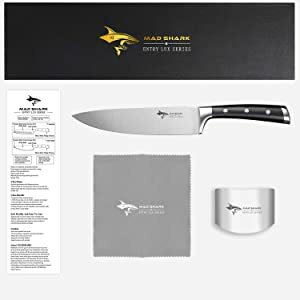 Why Choose MAD SHARK 8-inch Chef knife? 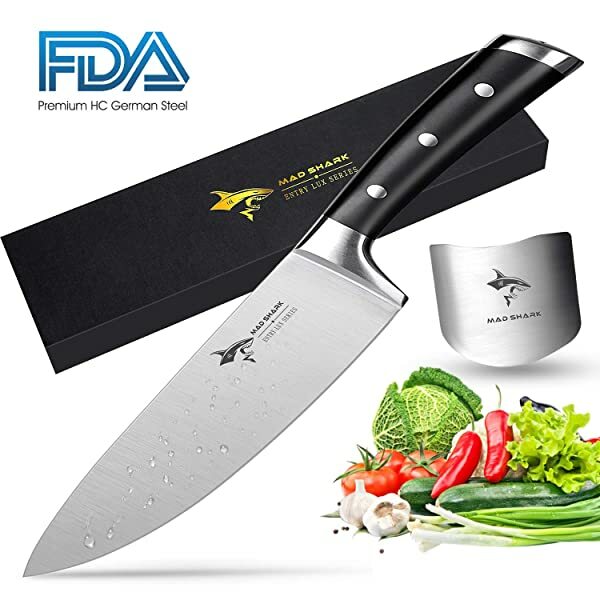 The professional chef knife can easily handle your daily kitchen tasks of slicing, dicing, mincing, cut fruit, vegetables and meat. 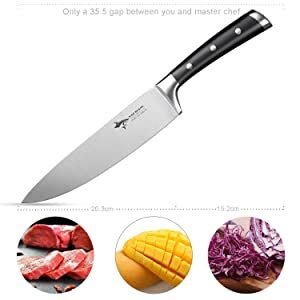 Each knife from MAD SHARK has gone through the extremely strict detection before it comes to your end. No defect is allowed from the very begining process. Limited Life-Time Support if there is any problems during usage. 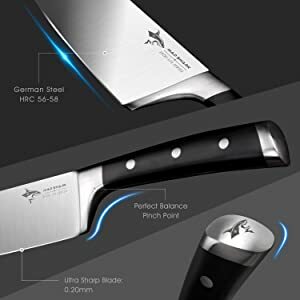 The high carbon German stainless steel (X50CrMoV15) blade increases control over how the blade moves through the cutting material, giving you enhanced precision over your chopping or slicing. 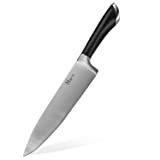 The chef knife comes with the HRC (Rockwell Hardness Scale) of 58, it's not easy to roll edge with excellent wear and stain resistance. The solid ABS handle can minimize wrist tension while providing a secure, comfortable grip no matter the size of your hand or where you are gripping the handle. The fact that it's lightweight also helps in enjoyable & precise cutting and maneuvering. Watch out for the sharp cutter edge and eliminate direct hand touch. 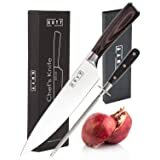 Clean the knife with soapy cloth after every use and keep it dry and safe. Hand washing is recommended yet safe for dishwasher. 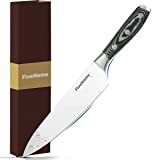 Hone the knife with honing steel every 2-3 month to maintain its sharpness.